It’s that time of year…well up north anyways! The temperatures are starting to drop a bit, and with it comes a change of seasons. 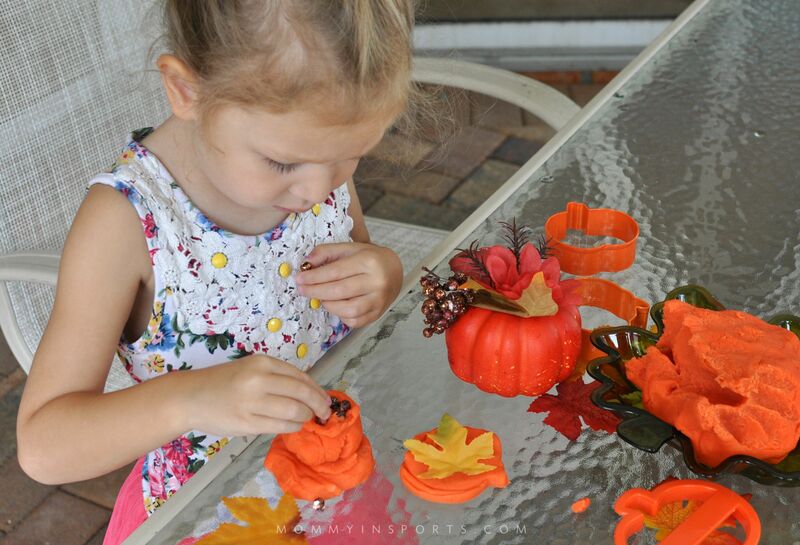 Of course here in South Florida we don’t feel fall until November if we’re lucky, but our kids are learning about autumn in school. And while I loathe anything pumpkin, our girls are already talking about Halloween, and desperately want to see the leaves change color. (I tried to explain palm trees don’t have leaves.) We don’t experience this season everyone raves about, but with a little help from the Dollar Tree we can bring fall to us! 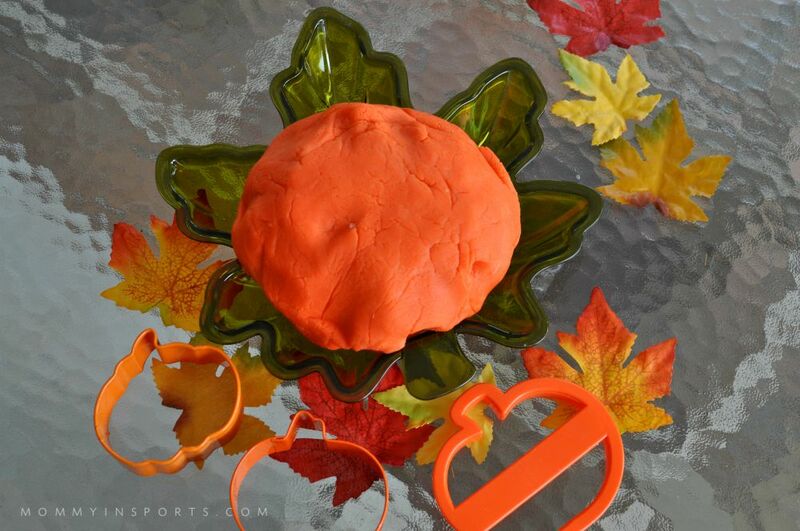 And since it’s National Playdough Day, I thought I’d share our new favorite – Pumpkin Playdough Recipe! A few fall leaves you can collect from your yard, or pick up at the Dollar store! And a lot of imagination! Emylia cut out pumpkins, and made a cake! She even destroyed one of my $1 pumpkin finds to construct her masterpiece, but that’s the fun of sensory play isn’t it? Putting out the props and watching as they create?! We may not get to break out the scarves and rakes, but we still have fun celebrating the holidays that are right around the corner! If you haven’t made homemade playdough before I assure you it’s super easy! We made this in 10 minutes, and the girls love measuring the flour, salt, and cream of tartar for me. The recipe is below, I hope you enjoy it! A simple yet fun math and sensory activity for kids! Mix all of the dry ingredients together, and then add the wet ingredients. Stir until well blended. Cook over medium heat, stirring constantly until a ball forms. When cooled store in a ziplock bag or airtight container. 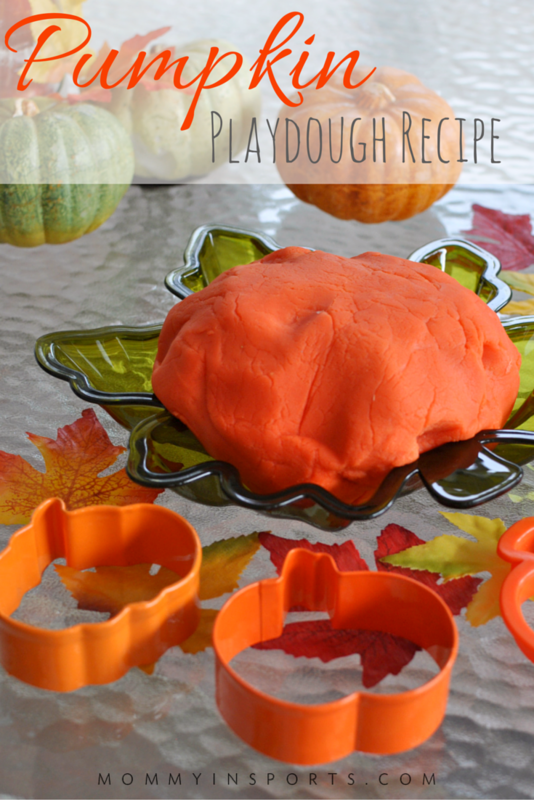 Looking for edible play dough recipes, or how to learn with with play dough? Check out this Ultimate Playdough Resource List from Miss Humblebee’s Academy! 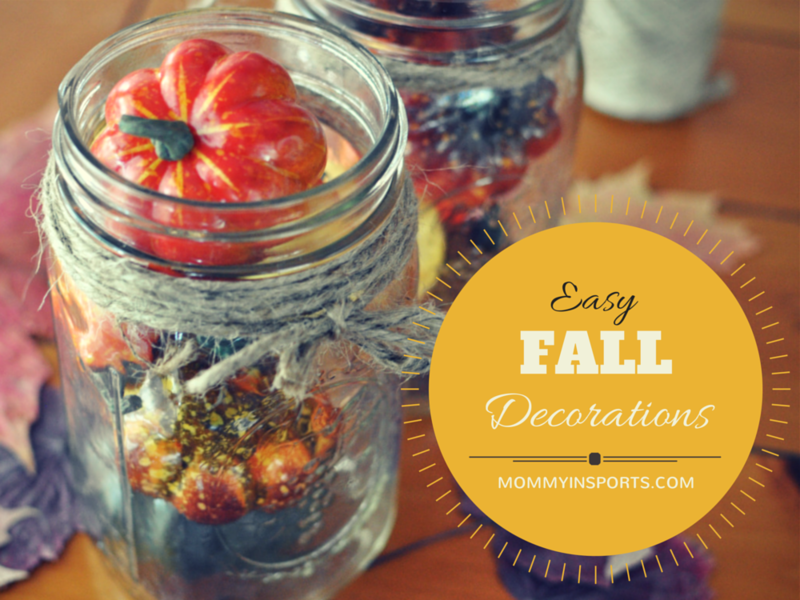 And if you’d like some more fall inspiration, please check out our Easy Fall Decorations! 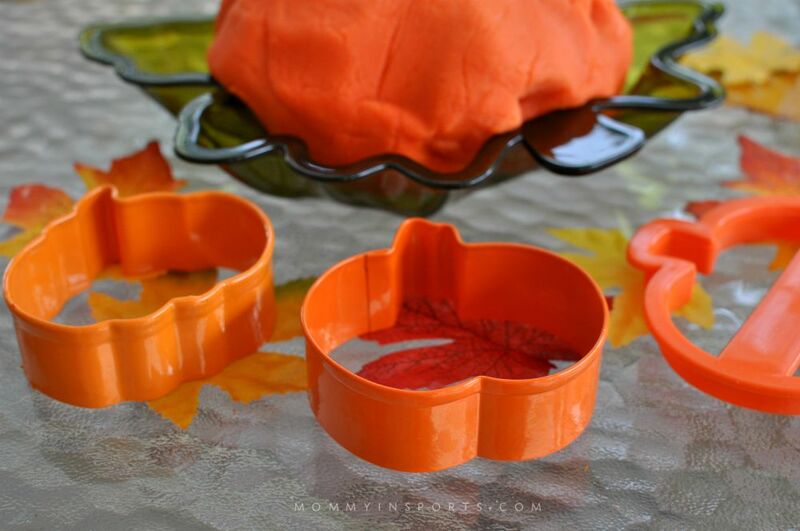 I love that you used the pumpkin scent in the play doh! pinning! Thank you! I know you LOVE pumpkin too! I love homemade playdoh recipes! My daughter is a teenager now and we always keep some around just for mixing and mashing on rainy days. Excellent recipe, can’t wait to try it! Great recipe! I totally pinned and stumbled it! This must smell amazing! I am off to pin your recipe now. This looks fun! I want to do this with the boys! Thanx! Pinned! We love making our own play dough! It is one of my daughters favorite after school activities. Cute cute cute! That looks absolutely delightful. And I shouldn’t mention that I used to eat Play-Doh when I was a kid and this looks even better than that salty nastiness! My son loves playdough! I was just reading an article that talks about the importance of sensory play, and while we often think it mostly involves the sense of touch, it really is important to focus on all the senses. I love that this playdough comes with a sent. 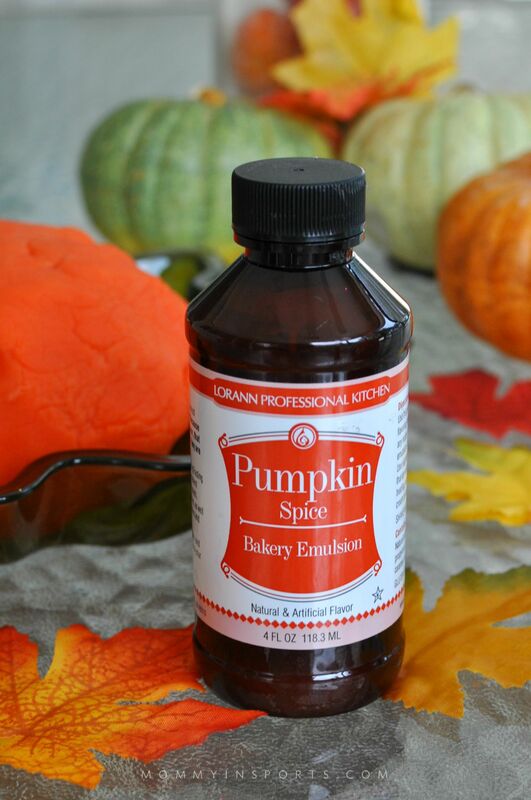 OK, you know how much I Love pumpkin anything! This is fabulous! Definitely pinning and trying out! Thanks Kristen! My girls would LOVE this! You cracked me up with the comment on the palm trees, btw. I am embarrassed to say that I used to eat Play-Doh when I was a kid. I do love pumpkin, so this recipe might make me do it again. HaHa. I would totally want to eat this playdough… lol. How clever. I want to make some ASAP. I’m totally into all things fall right now! Fall is my favorite time of year, but much too short here in Ohio. I might have to pull this recipe out to help it last a little longer even though we’ve already seen snow! Thanks for sharing. How fun! I had no idea it was National Playdough day!